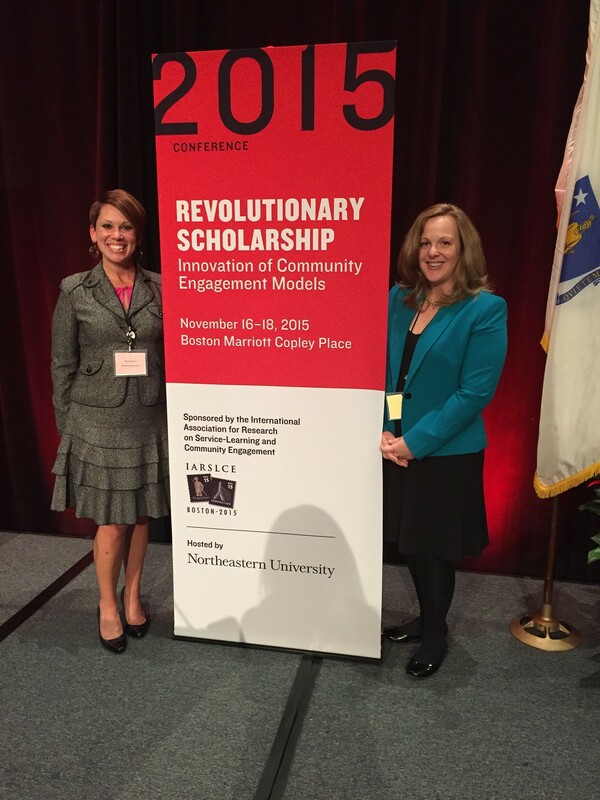 From Monday November 16th to Wednesday November 18th 2015, leaders in service-learning and community engagement from around the world congregated at the Boston Marriott Copley Place for the 2015 International Association for Research on Service-Learning and Community Engagement (IARSLCE) conference. Northeastern University, in collaboration with Massachusetts Campus Compact, served as the institutional host, and the conference was co-chaired by Director of Service-Learning Dr. Becca Berkey, and Director of the Human Services Program Dr. Lori Gardinier. The conference, themed Revolutionary Scholarship: Innovation of Community Engagement Models, invited thinkers and leaders in the field to present their research and share in ideas for future innovation through pre-conference sessions, panel discussions, and affinity groups. The conference was comprised of over 20 poster presentations and over 120 oral presentations, which included research papers, scholarly papers, stakeholder teams, and panel discussions. Hayward, in addition to attending the conference, also presented her own research paper, “Sustaining a Long Term International Service Learning Partnership: A Model for Inclusion and Action Upon Community Participant Feedback.” The partnership she references is with Para Sus Ninos, or For His Children, an evangelical Christian Ministry in Ecuador. For one week a year, Hayward’s students bring physical therapy services to residential care homes run by the organization for homeless children. This March, when Hayward takes her Physical Therapy Project 2 students to Ecuador over spring break, will mark her 9th trip. At the conference, Hayward spoke to what makes this partnership successful and sustainable in the long term. Hayward works to cultivate a meaningful experience for students and her partners in Ecuador, saying that she’s very willing to connect both groups on local and global fronts. Another important aspect of her partnership which Hayward’s paper addresses is her evaluation process, during which she surveys partners and staff to learn the benefits and drawbacks of her course’s presence at the organization. Community partner voices are something that Derek Lumpkins, Director of Neighborhood Partnerships and Programs at Northeastern, would have liked to have heard more of at the conference. Lumpkins, who oversees the new Northeastern Crossing, works to create a space for community members to interact with Northeastern administration and students. 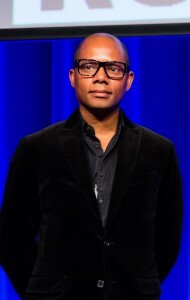 He feels that the community partner voice is one that should be consulted when engaging in this type of work, and that the conference would benefit from adding more of these voices in the future to ensure that those who work in this field are approaching partnerships in a way that is beneficial for all parties involved. Hayward also took a similar message away from a session she attended at the conference about building competency. In addition to building competency for global health care through service-learning, topics of presentations at the conference ranged from faculty development in service-learning implementation, to institutional context for service-learning, to service-learning as reflected in drama and literature. Nancy Kindelan, professor of Dramatic Literature and Theatre and Society, also found benefit from attending the conference, particularly as a faculty member who is new to the Service-Learning Program at Northeastern. “All of IARSLCE [conference] was new information,” Kindelan said, adding that there are certainly more opportunities for service-learning and community engagement to occur in the arts. “Theatre is uniquely posed to do a lot of good for the community,” Kindelan said, noting that some theaters have actors working with young students who write plays, and many theaters have educational outreach programs. Engaging more disciplines, classrooms, and community partners in service-learning is an on-going goal in the field, and one that will continue to be built upon in future IARSLCE conferences. As the institutional host, the Service-Learning Program at Northeastern uniquely benefitted from having a behind-the-scenes look at who and what research would ultimately be congregating at the conference, and enjoyed visitors from other institutions looking to continue the conversation about service-learning and community engagement. Next year’s conference will be held in New Orleans from September 26th-28th. Interviews with Professors Kindelan and Hayward and Derek Lumpkins contributed by Kris Fernandez and Noa Golan from the Street Team.